Hosted by Jacques Peretti, “The Men Who Made Us Fat” is a penetrating look at the disastrous legacy of a handful of 1970s American politicians and thinkers who revolutionized the way the world eats. What happened? Forty years ago, a handful of individuals in America made decisions that impact the way we eat today. By giving us sweeter food and an excess of it (when food companies switched to high-fructose corn syrup as a simple business decision to bring costs down), their policies led to one man’s work and warnings about sugar being ignored, and gave the risks in sugar a clean bill of health and focused on so-called low-fat food with hidden calories. 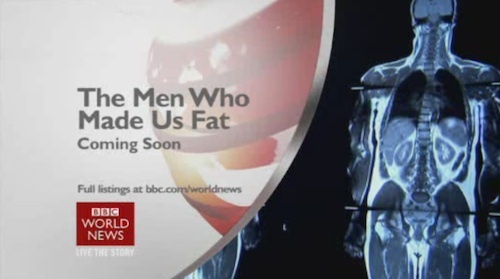 The 3-part series “The Men Who Made Us Fat” is also available on YouTube (divided into 12 videos). Details on each episode are below. In the first episode of the series, Jacques Peretti travels to America to investigate the story of high-fructose corn syrup (HFCS). The sweetener was championed in the U.S. in the 1970s by Richard Nixon’s agriculture secretary Earl Butz to make use of the excess corn grown by farmers. Cheaper and sweeter than sugar, it soon found its way into almost all processed foods and soft drinks. HFCS is not only sweeter than sugar, it also interferes with leptin, the hormone that controls appetite, so once you start eating or drinking it, you don’t know when to stop. Endocrinologist Robert Lustig was one of the first to recognize the dangers of HFCS but his findings were discredited at the time. Meanwhile a U.S, Congress report blamed fat, not sugar, for the disturbing rise in cardiovascular disease and the food industry responded with ranges of “low fat,” “heart healthy” products in which the fat was removed — but the substitute was yet more sugar. In the second episode of the series, Jacques Peretti investigates how the concept of “supersizing” changed our eating habits forever. How did we — once a nation of moderate eaters — start to want more? Speaking to Mike Donahue, former Vice President of McDonalds, Peretti explores the history behind the idea of supersizing. Forty years ago, McDonalds hired David Wallerstein, a former cinema manager who had introduced the idea of selling larger popcorn servings in his Chicago cinema. Wallerstein realized that people would eat more but they did not like the idea of appearing gluttonous by going back for seconds. By increasing the portion sizes and the cost, he could sell more food. In 1972, he introduced the idea to McDonalds and their first large fries went on sale. In this episode Perretti speaks with industry professionals to examine the story behind the introduction of value meals, king-size snacks and multi-buy promotions. How did the advertising industry encourage us to eat more often? Peretti also speaks to obesity expert Professor Philip James, who made recommendations in his 1996 report that the food industry should cease targeting children in their advertisements. He also speaks with Professor Terry Wilkin, who led a pioneering study into childhood weight gain; and former Labour MP David Hinchliffe, who chaired the 2003 Parliamentary Select Committee on Health. In the final episode of the series, Jacques Peretti examines assumptions about what is and is not healthy. He looks at how product marketing can seduce consumers into buying supposed “healthy foods” that can be high in sugar. Peretti speaks with Simon Wright, an “organic consultant” for Sainsbury’s in the 1990s, who explains how the food industry cashed in on the public’s concerns around salmonella infection, BSE (bovine spongiform encephalopathy or mad cow disease) and GMO (genetically-modified organisms) crops. Jacques also meets Kath Dalmeny, former policy director at the Food Commission, who explains some of the marketing strategies used by mainstream food producers. The episode also explores the impact of successive government initiatives and health campaigns, such as the proposal of “traffic light labeling,” the introduction of which the food industry lobbied hard against. Obesity and overweight. World Health Organization. Accessed 2014 Apr 3. Obesity and Overweight. Centers for Disease Control and Prevention. Accessed 2014 Apr 3.